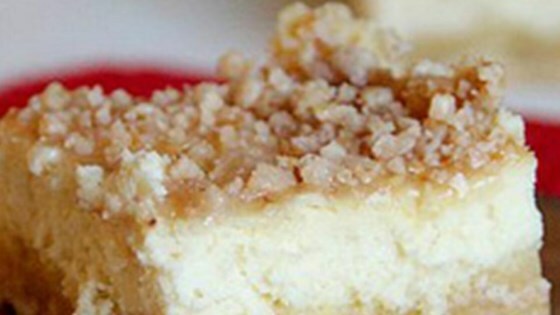 "Found this cheesecake cookie bars recipe going through my mom's recipe box. Good memories..."
Mix flour, walnuts, butter, and brown sugar together in a bowl. Line a 9x13-inch baking pan with half the crust mixture. Bake in the preheated oven until browned, about 15 minutes. Remove crust and leave oven on. Mix cream cheese and white sugar together in another bowl using an electric mixer until blended. Add eggs, milk, and vanilla extract; mix until blended. Pour on top of the baked crust. Sprinkle with remaining crust mixture. Bake in the hot oven until set, about 25 minutes. Use any nuts you prefer. It was pretty good, I actually used an Oreo crust that I got from the store instead of making my own. I think it gave it more sweetness which made it extra good! As suggested in one of the reviews I used 1 cup of sugar and baked it in an 8x8 pan baking it longer until done. I omitted the nuts since my son cannot eat them. This a keeper!